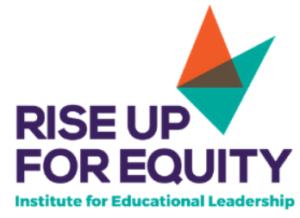 On January 25, 2019 the Institute for Educational Leadership (IEL) unveiled its 2018-2023 strategic plan, titled Rise Up for Equity. The plan aims to prepare leaders to eliminate systemic barriers in education and workforce development. To illustrate what “rise up for equity” means, IEL featured speakers and hosted two panels focused on preparing and mobilizing leaders and innovation, respectively. The panels featured representation from civil rights, educational and public policy organizations and challenged the audience to think critically about how to create conditions, capacities, cultures and policies that would allow each learner to succeed. One of the speakers at the event, Dr. Talisa Dixon, Superintendent of the Cleveland Heights-University Heights City School District, discussed why and how she made equity a priority in her district. When she started her role as a superintendent, she noticed that very few African American students were participating in Advanced Placement (AP) courses, despite making up roughly 80 percent of the district’s student population. When Dr. Dixon reached out to students to learn why they were not taking AP courses, she learned that many African American students did not know that they could take AP courses. After this experience, Dr. Dixon immediately told the district board that equity had to be a priority and that policy reform would be part of the district’s solution. Dr. Dixon’s experience reveals the urgent need to address equity gaps in the education and workforce system and highlights that equity gaps don’t only exist in the form of outcomes but also in the form of access to information and opportunities. Additionally, representatives from IEL discussed how the root causes of inequities occur on the institutional, system and structural levels and are based in racism, classism, sexism and ableism. As State CTE Directors leverage their positions to influence the Career Technical Education (CTE) system to promote equity, they must consider the root causes of inequities and commit to only advancing high-quality policies and programs that benefit each learner. To learn more about how to promote equity in CTE, view Advance CTE’s Making Good on the Promise Series. This entry was posted on Thursday, February 7th, 2019 at 8:16 am	and is filed under Uncategorized. You can follow any responses to this entry through the RSS 2.0 feed. Both comments and pings are currently closed.